You can read more about the types of environmental badges in the section Types of Environmental Badges. Breach of duty is severely punished - the fine may go up to 2,180 euros (i.e. approximately £ 1862). Restrictions apply to the A12 motorway from the 6.35th kilometre near the village of Langkampfen and the 90th km near the village of Zirl in both directions, and they apply to trucks / lorries over 7.5 tons. From 31. 12. 2022 - plans to prohibit entrance to vehicles with the emissions classes 0, 1, 2, 3 and 4. Winter period - from 1. 11. to 30. 4. Summer period - from 1. 5. to 31. 10. Also speed restrictions apply to all vehicles during the above-mentioned night hours. Are you going to Tyrol by private or business car? From 1. 1. 2018, a restriction applies to vehicles in categories N2 and N3, allowing entrance only to vehicles that fall within the EURO 4 emissions class and above. Entrance to the low-emissions zone of Tyrol requires that the coloured Pickerl plaque be affixed to the windscreen. This plaque states the emissions class. 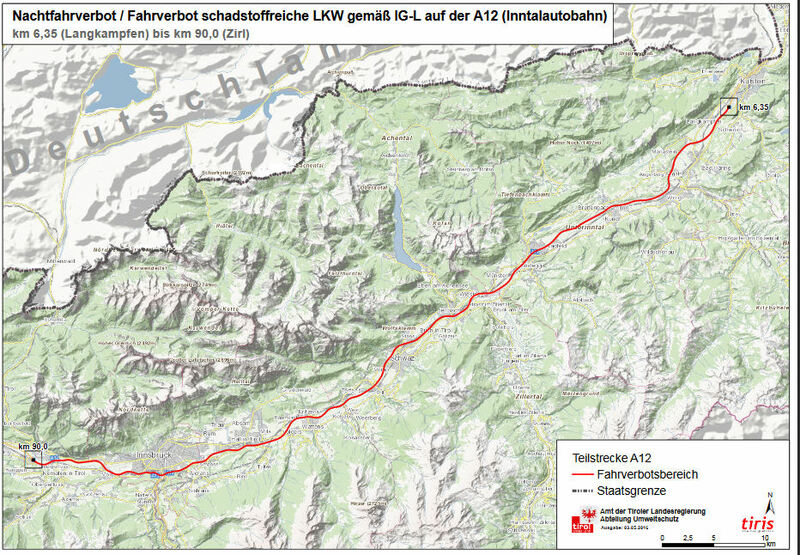 The restriction applies to the section of motorway in both directions between the 6.35th kilometre point, near the village of Langkampfen, and the 90th km point from Zirl. Order your environmental badge to enter Tyrol and get free shipping! The plaque has unlimited validity and should be placed in the bottom-right corner of the windscreen. Travelling To Tyrol By Car? Get Pickerl for Tyrol, Vienna and other cities. FREE delivery.